We could not have Play It Forward without our sponsors! Each year, we have had people and companies from around the United States donate items -- board games and non board games alike. We have been incredibly honored and humbled to have so much support from so many different groups, and wanted to recognize them here. We recognize our sponsors by different categories - each category is defined by the retail amount of items or services donated by each company or person. Each of our sponsors mean the world to all of us who help organize Play It Forward. Thank you again! Even the smallest donations help in a huge way! Interested in sponsoring us? Please fill out our contact form. These awesome companies donated $200 or more of items or services to help make Play It Forward a success! The Game Crafter is the world's first web-to-print game publishing company and offers a print on demand game publishing service. They saw how difficult it was for designers to get their ideas designed and published and have created a web platform that includes templates, instructions, videos, etc. The team at The Game Crafter has been really awesome to us and we are really thankful that they joined us this year. Granny Sue Quilts is a full service quilt shop that includes longarm quilting, classes, fabric, notions, books, rulers, etc. They donated a beautiful, custom made quilt in Multiple Myeloma Maroon! Action Phase Games is an Indianapolis based board game design studio. APG are close friends of ours and have supported us every year. This past year, they were acquired by Indie Boards & Cards (the company behind The Resistance). We are really excited to have their continued support this year! Stacey has been an awesome friend of Play It Forward for the last two years. Even though we had just met, Stacey donated several items to the event last year and was a leading charge in helping pick up after the event. We are really excited and honored that she has personally donated so many items again this year. Thank you, Stacey! Steve Jackson Games was founded in 1980 by Steve Jackson. These days, they are best known by their hugely successful line, Munchkin. We are incredibly excited to have them on for the first time this year, and are very honored that they sent us so many of their best games. UltraPRO makes a variety of board game accessories from multiple styles of deck boxes, to card sleeves, to playmats and dice. This is their first year supporting Play It Forward and they were extremely generous: they donated several boxes of dice bags, deck boxes, sleeves, and deck vaults. Their level of generosity is incredibly humbling, and we are honored to have their support this year. These awesome companies donated $100 or more of items or services to help make Play It Forward a success! Brotherwise Games' first game, Boss Monster was a Kickstarter hit in 2012, and the game has gone on to become one of the best selling card games in the U.S. They very generously donated two huge Boss Monster bundles. We are excited to have them on for the first time this year! Cheapass Games makes free, cheap, and deluxe games. Despite their name and cost, their games are always really incredible. They donated several copies of some of their best games. We are happy to have them on board for the first time this year! Game Trayz is dedicated to making high quality custom inserts and trays for popular games. They donated incredible inserts for several games. We are really happy to have them for the first time! Nerds of Naptown has been with us since the very beginning. Their cardholders are really well made and always get conversations going when we bring them to the table. We are thankful for their continued support! 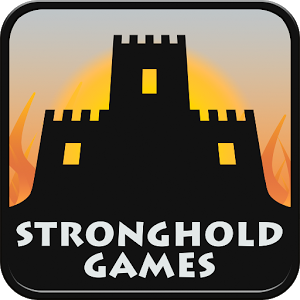 Stronghold Games has also been with us since the very beginning. We are really thankful for their continued support this year and for the friendships we have made with them over the years through Play It Forward. USAopoly has been making family friendly games since 1994. They donated some of their hottest games of the year. This is their first year sponsoring us and we couldn't be happier! These awesome companies donated $50 or more in items or services to help make Play It Forward a success! These awesome companies donated items and services to help make Play It Forward a success!